Thursday we drove with our WBCCI Airstream Caravan from Carlsbad KOA to Roswell Elks Lodge. We both were parkers, part of a team helping arrange where all the Airstreams would park upon arrival. The Elks Lodge has 22 parking spaces with water and electric service, and a full-service restaurant and bar in their lodge. We arrived two hours before the rest of the crew so we could receive our various assignments and organize how we were going to work this. Some were flag people at the last two intersections to bring people into the correct driveways. Three of us worked within the camping sites, directing the RVers into sites best suited to their rig’s lengths. The weather was trying. The sun was shining hotly and we peeled our coats and rolled up shirt sleeves. Rain started falling, and we donned our rain coats or held umbrellas over our heads. Rain would stop but the sun hid behind the clouds and we pushed our sleeves back down and put on sweaters. Repeat; repeat. Friday the day started very cool, 46 degrees, and warmed to 66 degrees with constant winds and sunshine. Forecast calls for gusts to 55mph in the afternoon. 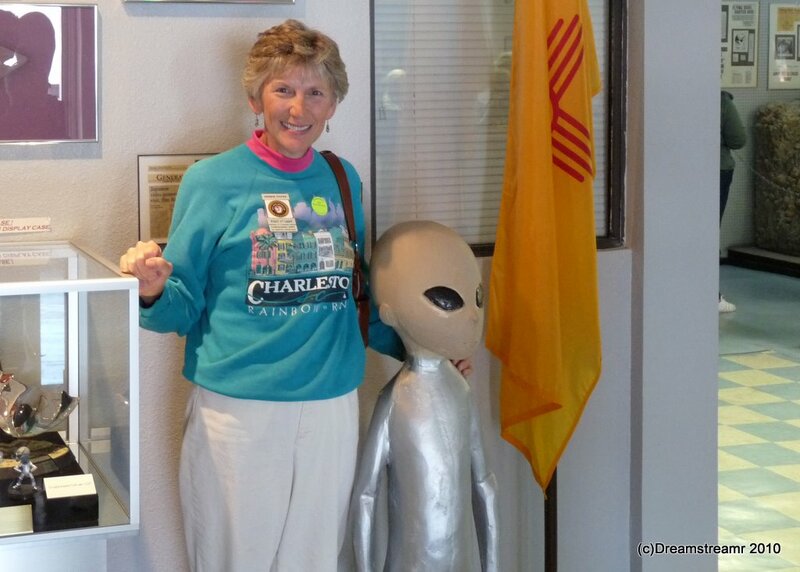 We visited the UFO Museum and Research Center in Roswell, NM. This museum claims impartiality, presenting what is known and what was reported, and purports to let the visitors form their own opinions. We’ll probably never learn the full background and purpose of the government’s operations. We are convinced the U.S. government conducted apparent cover-up operations regarding some event. Jim’s poli sci studies included a class on Machiavelli’s The Prince. The story essentially reads: the ends justify the means whenever preserving the republic and cementing the peoples loyalty to the leader. After museum and lunch we took our truck to fill the gas tank with some of the $2.73 gasoline we saw on the way in yesterday. Not available, least expensive is $2.84 — we bought anyway, 26 gallons, so spent almost $3.00 extra from waiting a day. Lesson learned: don’t procrastinate. Saturday is our fifth consecutive very windy day. Spring is roaring in like a lion, it seems. We drove an hour to Lincoln, NM, a very well preserved old town of the west. Our Lincoln walking tour and museum browsing occupied several hours and we could have spent longer in this neat little unincorporated settlement. 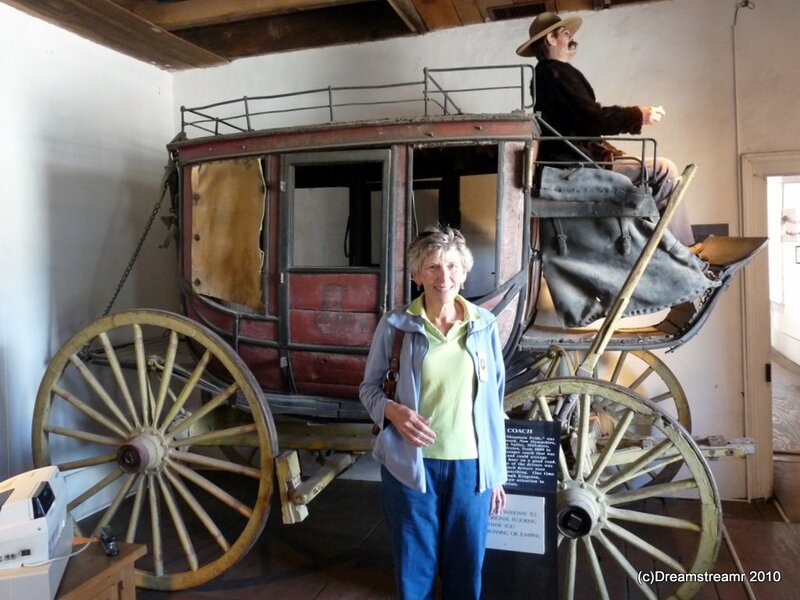 Our caravan requested we arrive at our campground by four o’clock, so we saddled up and drove toward BLM’s Capitan, NM, has a must see attraction, though. 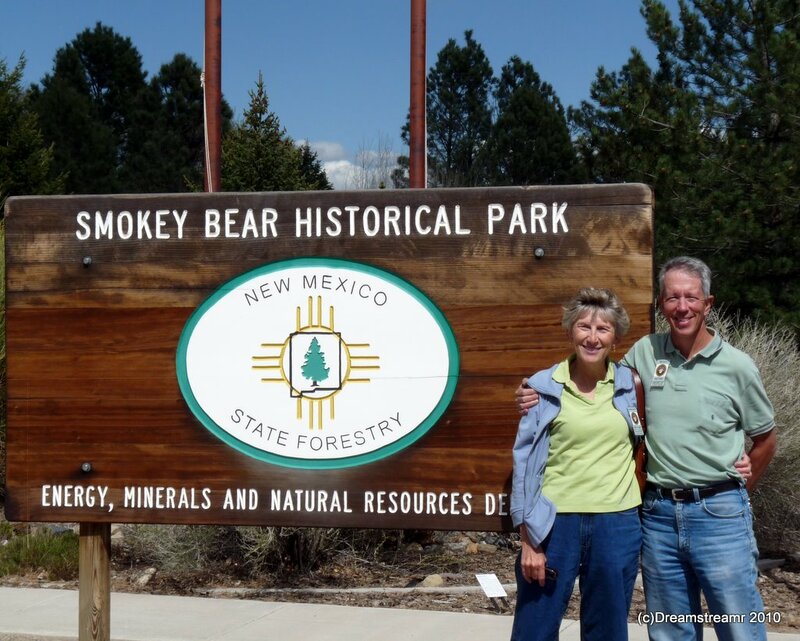 We visited the Smokey Bear Museum and Park, and actually viewed Smokey Bear’s gravesite. His successors have ably carried on the courageous and important work Smokey started in 1950. This is a nice little museum with plenty of on-street parking for RVs, nice displays and an informative video show, and with a short nature trail. From Capitan we had a short drive to Valley of Fires Recreation campground. 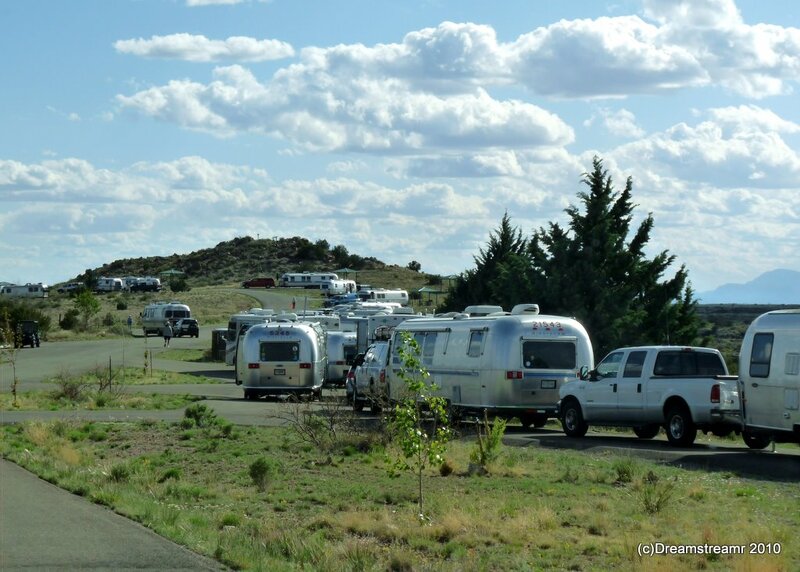 This is a gorgeous but not-so-large campground especially for 32 Airstream trailers and motor homes. Our caravan’s parking committee had their hands full spotting our entire group in a campground organized for 19 RVs, but they did a fine job and we all had fine spaces. Valley of Fires is the site of New Mexico Department of Transportation’s (and possibly the USA’s) largest surplus asphalt paving dump site (no, not really). You can see in the picture this huge gnarled hunk of black basalt rock. 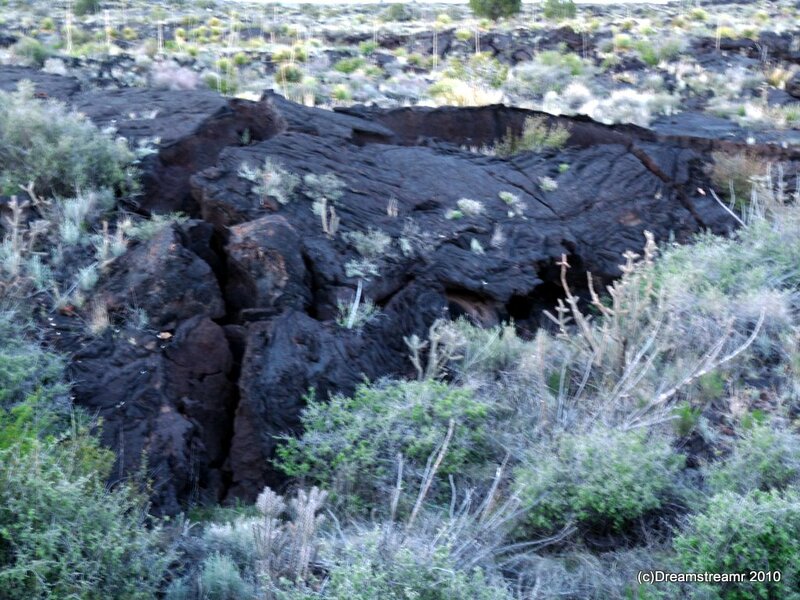 The valley contains a forty-four mile stretch of this extremely rough volcanic rock and looks as though it could have been a decades-long collection of asphalt debris. The stuff looks tough enough to tear the treads off an army tank. We stayed two nights at the Sky City Casino and Campground. The casino effectively refunded each of us a night of camping as credit for ten minutes worth of a nickel slot machine ($20). The real attraction, though, is the Sky City pueblo and cultural center. 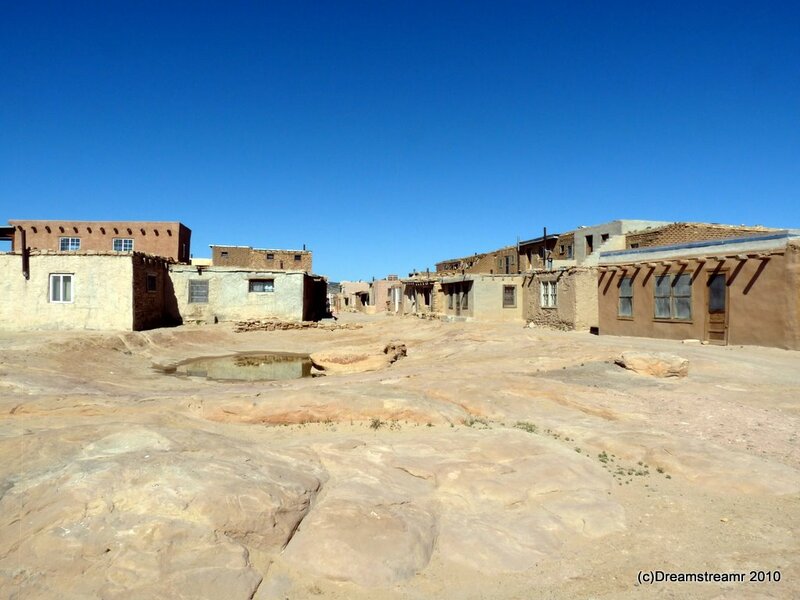 Our caravan arranged a guided tour of the Acoma Sky City pueblo, the oldest continuously inhabited village in the United States. 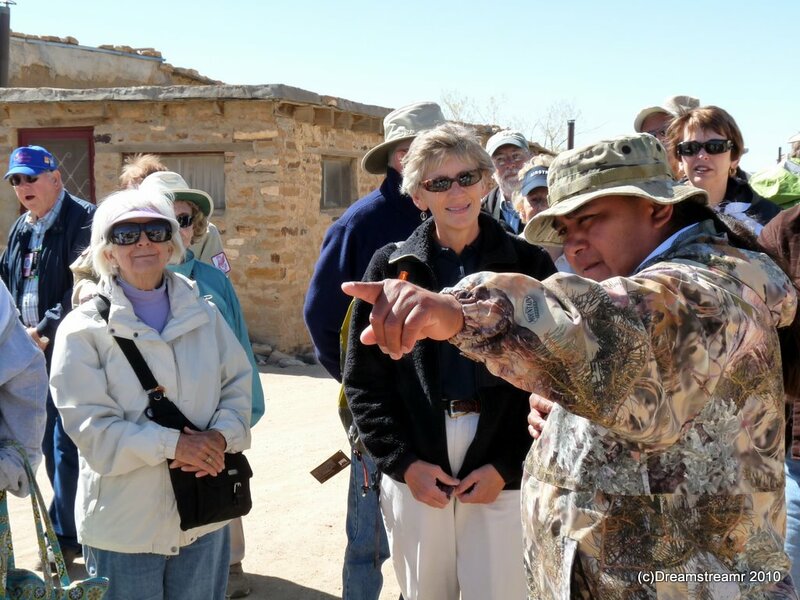 Our tour guide for this 3/4 mile walking tour explained the history and current lifestyle of living almost 370 feet above the desert floor. No running water then, nor now. Water is carried up from drinking water cisterns far below. No electricity then, nor now. Food was cultivated far below, and now Wal-Mart vends food to the inhabitants. But religious practices have remained largely unchanged, according to Conran, our guide. A dozen of us, at the end of our guided tour on the mesa, elected to descend by one of the seven paths down from the mesa. 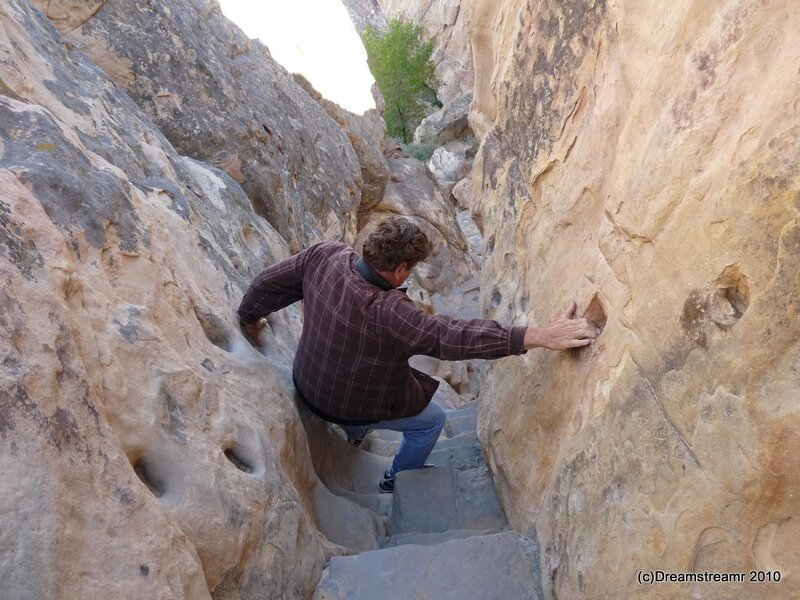 This path is less a path and more notched steps in ancient sandstone. Thankfully someone worked handholds into the stone. We doubt the Acoma Indians needed these — the handholds were cut to benefit tourists like us. And we found these very helpful in our descent. We toured the Sky City Cultural Center (opened just two weeks ago on April 16, 2010) after our tour of the Sky City pueblo. The museum, gift shop, and building are beautiful and very nicely built. And the Cultural Center’s Cafe served very reasonably priced and delicious posole and lamb stews, both accompanied by fry bread or horno bread. The fry bread is tasty but neither good for regular consumption nor, apparently, truly traditional Native American food. Our tours, short drives, and the weather all have been very nice, if windy. We’re enjoying the caravan and looking forward to more in the coming weeks. We head next to Albuquerque for five days of small tours including a Segway adventure and an i-House tour. We’ll tell you about it next time.